Chances are, you’re reading this article because your back pain is bad. Maybe it’s getting worse, maybe it’s just not going away. Most people with back pain — and some 80 percent of Americans experience lower back pain in their lives — chalk up their symptoms to mechanical problems with the way the bones, nerves, discs, and other parts of the spine function. Mechanical back pain is what happens when you have a bulging or slipped disc, or when you “throw your back out” moving furniture. But there’s another kind of back pain you need to know about, and it has to do with inflammation in the vertebrae of your spine and in the sacroiliac joints (where the spine connects with the pelvis). This back pain is considered a type of arthritis that causes swelling and inflammation. It is known as ankylosing spondylitis (AS) or axial spondyloarthritis (AxSpA). Inflammatory back pain like ankylosing spondylitis is treated very differently from mechanical back pain, and it’s important to get a proper diagnosis and treatment. A rheumatologist is the kind of doctor that typically treats inflammatory back pain. How Can You Tell If Your Back Pain Is Actually Ankylosing Spondylitis? 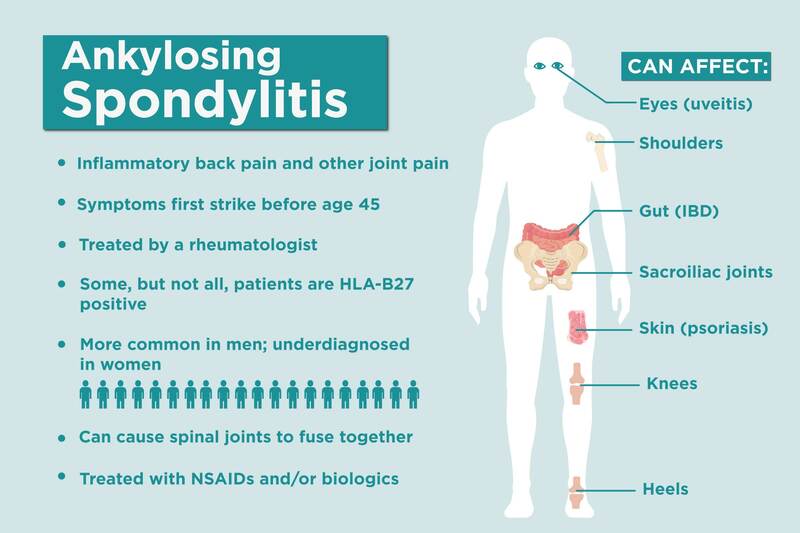 There’s no easy answer, which is why it tends to take people a very long time to get diagnosed with ankylosing spondylitis. According to research from our ArthritisPower research registry, nearly a third of respondents with AS reported that it took more than 10 years to receive a formal diagnosis from when they began seeking medical attention. Some AS patients will develop peripheral symptoms in other joints — pain, swelling, or stiffness in their ankles, knees, or hips, for example — which could be confused for other kinds of arthritis. 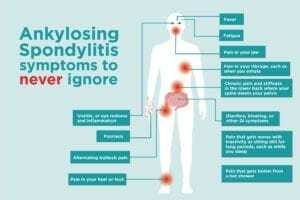 Figuring out that your specific mix of symptoms is ankylosing spondylitis requires careful symptom tracking from you, and some detective work and awareness on the part of your doctor. Pay attention to this list of possible AS symptoms. Keep in mind you might only have a few of these. If you’re at all concerned that your back pain or other symptoms could be ankylosing spondylitis, call your primary care doctor and tell them that. You ultimately want to be referred to a rheumatologist for further testing and diagnosis. Ankylosing spondylitis causes chronic pain that can come and go. You might experience periods of flares and stiffness, and other times when you don’t feel pain as acutely. The symptoms may ease up or disappear for a period of time, but they ultimately return. When your back pain occurs because your immune system is attacking your joints, inflammatory cells and proteins accumulate in the fluid in your joints. When you don’t move your joints for a long time, such as during a marathon work meeting or while you sleep, those inflammatory chemicals settle and make your pain worse. This is why people with AS feel better when they are active. 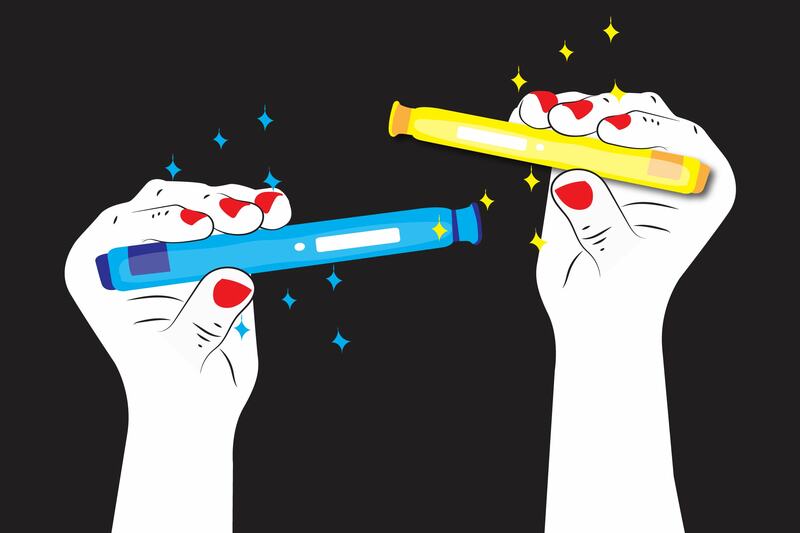 “People with AS don’t like to sit still,” says Sacramento-based rheumatologist Doug Roberts, MD. “They have to move around.” It’s not uncommon for AS patients to wake up in the second half of the night and pace around their house, unable to bear the thought of climbing back into bed. Similarly to exercise and activity improving AS back pain, a hot shower or a heating pad often helps inflammatory back pain feel better too. The hot water helps loosen up the inflammatory chemicals in your spine and other joints, temporarily relieving symptoms. This is one of those symptoms where you know it if you have it. Your pain feels like it moves from side to side in your lower back near your rear end. “Alternating buttock pain” can make it hard to sit still, like during a long stretch of time at work at your desk, or during a movie. AS can also cause inflammation at the point where your rib cage connects with your breastbone and spine. This can make it ache or hurt when you exhale. If your ribcage gets very stiff, you might be limited in how much your chest can expand, making it harder to breathe. Another prominent feature of AS is that it causes inflammation of the entetheses, which is where ligaments and tendons attach to bones. A common location is by your Achilles tendon at the back of your heel, though this can occur throughout the body. Sometimes people call these areas “hot spots.” Your doctor may check for pain and tenderness at various hot spots during your visits. When you get inflammation in your feet from AS, it can hurt badly enough to affect your ability to walk. Jaw inflammation isn’t as common in AS as the above symptoms, but it can still occur in a smaller number of patients. Your jaw might ache or hurt when you eat. AS occurs because your immune system is overactive and is attacking your body’s own joints. An overactive immune system can cause what doctors call “systemic” symptoms in addition to pain and swelling. A low-grade fever that lingers or comes and goes can be a sign of ankylosing spondylitis. That was one of the first red flags for AS patient Hannah Moskowitz, 27. “It was such a weird thing. I had this low fever almost every day for a year,” she says. There is genetic overlap between AS and inflammatory bowel diseases like ulcerative colitis and Crohn’s disease, which is why these diseases tend to co-occur in patients. About 10 percent of AS patients develop IBD, but even people without an official IBD diagnosis experience inflammation in the gastrointestinal tract that can cause bloating, diarrhea, and other GI symptoms. If your lower back pain occurs with GI upset, that could be a red flag that your pain is inflammatory in nature. In some people with AS, the symptom that sends them to seek treatment isn’t related to back or hip pain — it’s eye redness. Uveitis, or inflammation of the part of the eye called the uvea, occurs in as many as 30 percent of people with ankylosing spondylitis. In many cases, it can be very painful. Your eyes may feel extremely sensitive to sunlight, and treatment like eye drops for pinkeye won’t improve things. Read more about uveitis symptoms and treatment here. Psoriasis is an autoimmune disorder characterized by red, silvery scaly plaques on the skin (though there are different kind of psoriasis and psoriasis symptoms can present differently). Up to 30 percent of people with psoriasis also develop joint pain and other symptoms, which is a separate disease called psoriatic arthritis. But psoriasis can also co-occur with ankylosing spondylitis. If someone has axial involvement, which means pain and inflammation is occurring in the spine, and mild psoriasis, then they have both psoriasis and AS. “If someone really has the presentation of psoriatic arthritis, with a lot of peripheral arthritis, and then has axial involvement too we call it psoriatic arthritis with axial involvement,” says Dr. Norton. Regardless of the exact diagnosis, having psoriasis along with any kind of joint pain is a clue that you’re dealing with a kind of arthritis and you should see a rheumatologist. The inflammation throughout your body also causes fatigue, which some AS patients say is as bad as, if not worse than, the pain and stiffness. Fatigue is more than feeling tired from too little sleep; it’s like you’re too weak and exhausted to function like your usual self. The tiredness feels physical, not just mental. Here’s what you can do to help manage arthritis fatigue. For more information about ankylosing spondylitis, check out this list to help figure out if your back pain is mechanical or inflammatory. Excellent Article. Printing for my GP who is not a Alpha Gal believer. Rheumatologists here refuse to see me because I have a confirmed diagnosis of Osteoarthritis but have also tested positive for Alpha Gal, Dairy and Red Meat triggers. Seeing a doctor is an issue. If you are old so many symptoms hide behind your luck.